PLASTINARIUM – The Plastination laboratory in Guben! Located in Guben, a 3,000 sq.m. exhibition space is housed in a former cloth factory that has been renovated and equipped with the latest machinery and set up as a fully operational Plastination laboratory. This facility is designed to present visitors with comprehensive insights into the Plastination processes and various dissection techniques. Small and large anatomical specimens are created with state of the art technology, right before the eyes of visitors. Reduction upon presentation of valid ID or appropriate valid document only. ** ** Children up to 14 years of age: A responsible adult must accompany children under 14. Groups of 20 or more may schedule a visit of the exhibition including an optional guided tour, on other days as well. Guided tours are only available for groups of 10 or more and must be booked in advance. Tours last approximately 2 hours and are available at a 70 EUR surcharge per group, in addition to admission price. We recommend groups of max. 30 people per tour. Groups of less than 10 can be arranged for 170 EUR per group, in addition to admission price. Please register groups for guided tours by telephone, personally, by fax or by e-mail. Guben is a small town located in the federal state of Brandenburg, directly on the German-Polish border. The PLASTINARIUM can be reached by car in about two hours (about 130 km/80 miles) from Berlin or Dresden. Trains run every hour from Berlin to Guben. 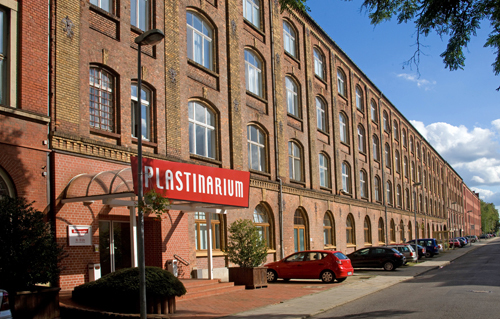 The PLASTINARIUM is very close to the Guben train station (3 min walking distance).